Properly deployed, these advances will improved - the “old” way is not always It is easy to argue that the biggest ad- face-to-face learning. There are many improve safety - on that, the research is the “best” way. Now that we are on this vance in training in the last 20 years has ways to “blend” the learning experience, but let’s look at one model - that of us- ing on-line self-study as a precursor to classroom or on-board training. This is an incredibly successful model that has been proven in thousands of studies to signi? cantly improve training while at the same time being reasonably inexpen- sive and easy to implement. It is easy to understand how it can be helpful. 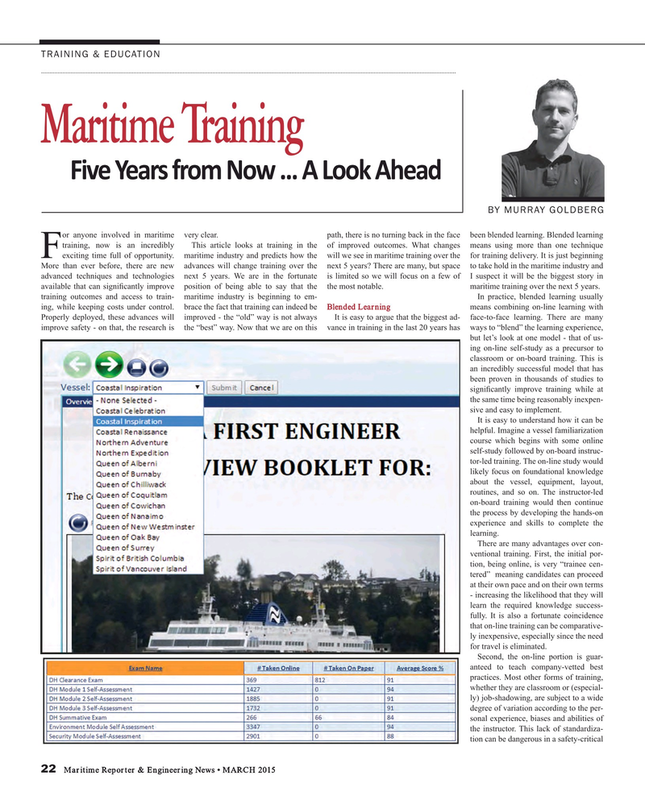 Imagine a vessel familiarization course which begins with some online self-study followed by on-board instruc- tor-led training. The on-line study would likely focus on foundational knowledge about the vessel, equipment, layout, routines, and so on. The instructor-led on-board training would then continue the process by developing the hands-on experience and skills to complete the learning. There are many advantages over con- ventional training. First, the initial por- tion, being online, is very “trainee cen- tered” meaning candidates can proceed at their own pace and on their own terms - increasing the likelihood that they will learn the required knowledge success- fully. It is also a fortunate coincidence that on-line training can be comparative- ly inexpensive, especially since the need for travel is eliminated.